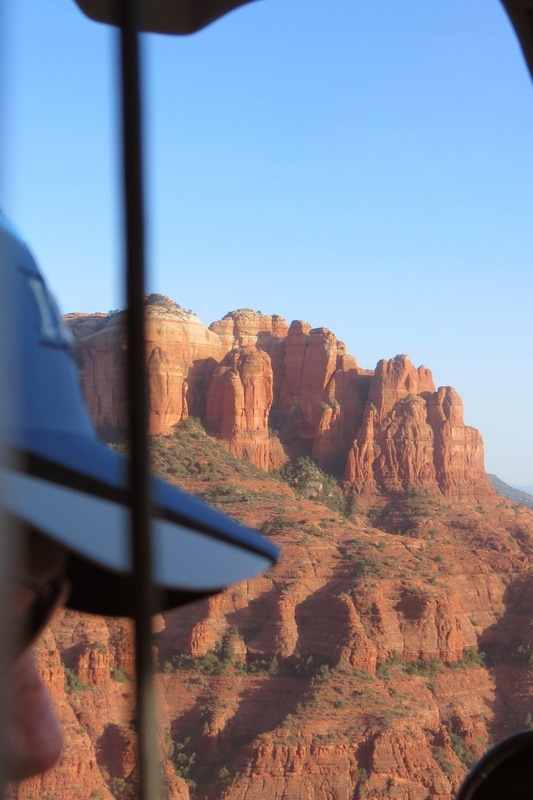 After reserving a Pink Jeep Tour of Sedona, I inquired about a Hot Air Balloon ride that I was also considering. The vendor told me they often had to cancel due to high winds, and recommended a helicopter tour instead. In fact, she could get us a "free" helicopter tour if we would take a tour and listen to a presentation at the Sedona Golf resort. That sounded doable, so off we went to the Golf Resort for our tour. Our tour guide was Jackie, who gave us a nice tour of the grounds via golf cart. Then we went back to the center for the (no surprise here) presentation of their Time Share Plan. This is a picture of their CEO who once appeared on the TV show, Undercover Boss. Jackie did a super job explaining how their Time Share Plan works with resorts all over the world that can be accessed using the "points" you purchase. I listened carefully because I am interested in some overseas travel where I can't take my RV. Then we went out in the golf cart again to see their units. Beautiful accommodations. View from the balcony. In the end, I decided the plan was not a good economic fit for me...so I declined. True to their word, we received vouchers for the helicopter tour scheduled for the next day. At the Airport there is a vista with this view overlooking Sedona. Our ride awaits. There were six of us passengers. One man in front beside the pilot...he had the best seat. Two seats facing backwards behind the pilot...me in one and another lady in the other. And then three in the back...poor Birdie! No surprise they had trouble closing the door. No surprise that we were told ahead of time, that if the door opened during flight...not to worry, it was not an emergency, lol. Most of the features the pilot pointed out were on the other side from me, so I tried to get pictures past people's heads. Then I gave up and took pictures out my side...don't remember the names of the formations anyway. And then of course, the door opened. I don't think this guy thought it was no big deal. He was hanging on to the door with one hand and Birdie with the other. But I had some nice views out my side. The road below is called Broken Arrow...one of the routes our Pink Jeep Tour will follow. This is called Submarine Rock. Hikers are climbing on it. One of the many canyons in the area. I think this is the old wagon road that we will take on the Scenic Rim Tour in the Pink Jeep. It goes to the top of the Mogollon Rim. The road is 89A that leads north to our campground, and past that to Flagstaff. Meanwhile, the door is still open. No problem, lol. That's an arch with hikers on top. Two of many round-abouts in Sedona. And we landed safely, none-too-soon for the man holding the door. It was OK, but I'm glad I didn't have to pay for it. Next post will be the super awesome, well worth the price Pink Jeep Tour! Adventures come in all sizes, don't they. Glad it wasn't you holding the door. It was, however, a very different perspective, and the shadows were wonderful. I don't think the guy holding the door enjoyed the tour at all. I wouldn't have either. You did get some nice shots of the landscape from there though. loved your tour of Sedona from the air - such a wonderful area. enjoy your pink jeep ride. we've driven most of that area in Willie - including the Broken Arrow section.